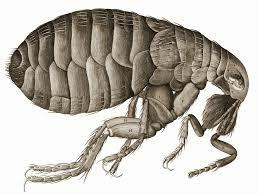 Adult fleas are small, black to brown-black creatures without wings. They are 1-4 mm long with laterally flat bodies and strong spring-like legs capable of leaping several inches high. They are wingless, with mouthparts adapted for piercing skin and sucking blood. Fleas are external parasites, suriving off the blood of mammals and birds. Fleas can survive several months without a blood meal if no host is available and adults can live for many years. People entering vacant homes or buildings are sometimes attacked by hungry fleas awakened from hibernation by the walking vibration, detected body heat from a potential host and the emission of detectable carbon dioxide. Controlling of fleas takes persistence, patience and a visit to your local veterinarian if you have pets for a preventative. Vacuuming daily is a must as the vibration will cause the pupae to hatch and the adult will emerge only to be taken up by the suction. Females require a blood meal to lay their eggs. Fleas cycle through stages from egg to larvae, pupae and then adult. The eggs from the flea species that commonly attack man generally take 10-21 days to hatch out depending on the temperature and humidity present. In a cold environment the hatch cycle can take several weeks to complete. Eggs are laid on the host but are not attached and commonly fall off ending in nearby cracks and crevices, on bedding, under edges of carpeting and in pet boxes or kennels. The female flea produces 4-8 eggs after each blood meal and can lay typically hundreds of eggs during her life span. If you’ve discovered fleas in your home, the best thing to do is call in the professionals. Contact us today to schedule your appointment to get rid of fleas for good.